MySpace feels heat from UK rivals, jumps shark? Alarm bells will be ringing at MySpace UK after the News Corp-owned site posted a 300,000 drop in visitors last month, according to new stats from Nielsen//NetRatings. The month saw MySpace’s unique visitors from Britain falling from 6.8m to 6.5m in May – only the second monthly drop it has experienced since November 2005. With Facebook in the ascendancy, has MySpace finally jumped the shark? The social network still remains by far the most popular in the UK, but the figures indicate rival Facebook’s audience has grown 19 times faster over the last six months. If May’s trend was to continue until September, according to Nielsen//NetRatings analyst Alex Burmaster, both Bebo and Facebook would catch up with MySpace. MySpace (6.5m) still has many more unique visitors from the UK than Facebook (3.2m) and Bebo (4m), according to the figures. However, growing competition globally has caught the attention of News Corp boss Rupert Murdoch. comScore figures released last week show Facebook has increased its UK visitor base by over 2,000% in the last year. MySpace is far more dominant in the US than the UK – having four times the visitors of Facebook stateside, compared to twice the number of visitors in the UK. Bebo’s success is very much UK-based – it is visited by 12% of Britons online compared to just 1% of the US online population. 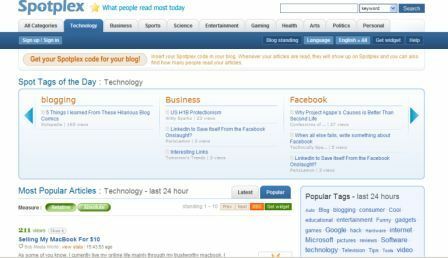 Further bad news for MySpace is that it seems to be well behind its two rivals on user engagement. The average visitor to Bebo, the figures show, spends just over an hour and a half on the site – almost ten more minutes than the average ‘Facebooker’ and almost a whole hour more than the average MySpacer’. 444,000 Britons online visited MySpace, Bebo and Facebook in May 2007. 53% of Facebook’s UK visitors also visited MySpace, as did 43% of Bebo’s visitors. 26% of UK MySpace visitors also visited Bebo; 26% also visited Facebook. 16% of UK Bebo visitors also visited Facebook; 43% also visited MySpace. Spotplex is a recently launched news aggregator that offers an alternative to the Digg model where users submit and vote on stories. Instead, articles are ranked by the number of pageviews they receive.